Lokomotiv Moscow coach Slaven Bilic has come out in defence of Russian football, claiming that accusations of crowd trouble and racism are greatly exaggerated. In November, Dinamo Moscow goalkeeper Anton Shunin was injured when fans of Zenit St Petersburg threw a firecracker onto the pitch during a Russian Premier League match. The match was subsequently abandoned and Dinamo were awarded a 3-0 win. Zenit were again in the headlines a month later when their biggest fans' group, Landskrona, published a manifesto, urging the club not to sign any black or gay players. But the 44-year-old Bilic, who ended a six-year spell in charge of Croatia after Euro 2012 to join Lokomotiv, thinks these incidents are not indicative of Russian football. "On the contrary, it's a very peaceful atmosphere at the stadiums," he told the BBC's World Football programme. "I follow football of course, I love football and there were more racist incidents in Italy and Spain from after the Euros, but you can't say those countries have a problem with racism. "I live in Russia, I watch Russia and as a nation they are very, very polite and they're very peaceful. "If you take out some idiots shouting at or booing the coloured guy in one or a couple of games, you can't then say the whole league or the whole country is like that. On the contrary, it isn't. "We have many coloured guys. We were in Grozny, we were in Zenit, we were everywhere. Not even once have I noticed it." The focus on issues of crowd behaviour in Russia is likely to intensify as the 2018 World Cup, hosted by Russia, gets closer. But ex-West Ham and Everton defender Bilic is confident of a successful tournament. 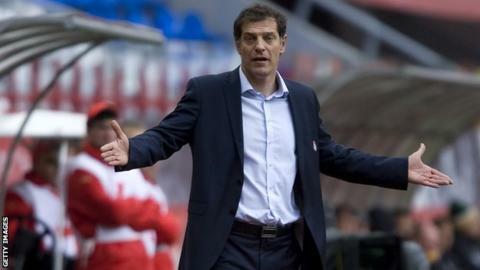 "Like every World Cup it's going to be better than the one before," added Bilic. "With Russia, it's going to give them what they are still missing. They've got the money, they have the passion, they have a good league and the tradition, it's a huge country and they've got everything apart from good stadiums. "They need to build new stadiums and they're going to do it for the World Cup. They're going to use that situation like Poland did (for the 2012 Euros) and I think it's going to be a great World Cup."